For all suggestions, pictures aren't quite as helpful to me, and I do actually need an in-game name or item ID for all suggestions. Thx. Ok, its Crisping Cuirass, Supple Workgloves and Trapper's Snagged Boots, level 10 leather armor set. What about adding in store items in rotation for like 5-10k fashion coupons for like a month or so? Something up there so that fashion coupons can gain some value. Like a store item that really don't sell that well but is a really nice look. No thanks on the crystalline mask UNLESS it's a different item than the original. I would personally want the imperator weapons as weapon skins, but I don't know the item ids. Hopefully someone else may know. The name of the ninja weapon itself is the Protestar off the top of my head if that helps. Eh, frankly I got the outfit during the leveling event, and... Hey, it's just leveling a character. I ain't any special because of that, nothing that affects me if people want the costume that I could get on that event and don't even like by the way. to bad i didn't play or refused to play when they were handing out masks because to me its just a cosmetic and its meh like you u said it was easy to get so sure pop one in the ole fashion coupons store for me at 300 coupons please. Ninja's noctenium skin also seems to be exactly the same as the North Star skin. Because those classes were added after alliance. Neither reaper, gunner, brawler, ninja or valk had noctenium gear. I figured this was the case. However, Brawler got a skin that's unique in the shop, and Gunner got a red re-color of the Celeboom/Exalted Arcannon. I'm pretty sure both of those skins are used for avatar weapons you come across while leveling, but I couldn't tell you exactly which ones they are (I think Brawler is the one you get in the low 40s, and Gunner is one of the ones after level 60?). Valkyrie also got a re-color, but it's barely noticeable and looks almost identical to the Vile Runepike. Hope it helps, i will try to find more... All from Teradatabase! I would not suggest alliance masks.. because some players actually worked hard back then to earn them. If you guys want it back should do something about cuv or something similar to the old alliance. 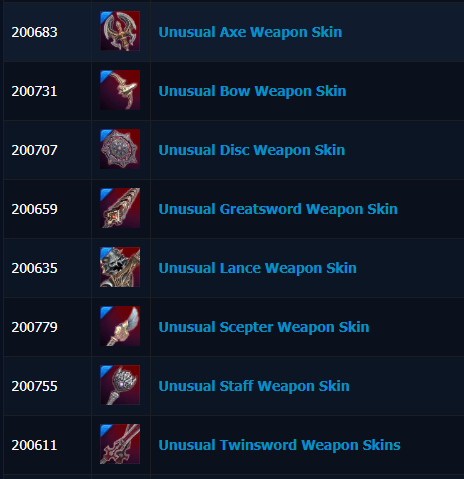 Duno if the weapons themselves can be turned into skins :shrug: But there's that. Wonder how that site you using gets those item codes and such, and wonder/hope they also don't change by builds. I mean you can somehow crack up the game (usually for this type of stuff quite easily just opening the packets) but anyway interested in how it's done, or if there is some other way to find it out. I have no idea, its just there so i just used it! Anyways..